To create a full-fledged dhxForm object you must make 4 steps. 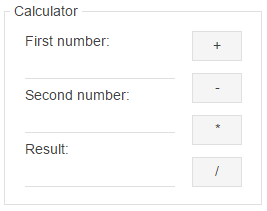 For detailed explanation we'll create a simple app (based on form) and show initialization details by an example. Create a new HTML container. Put a form into some DHTMLX container component: layout, window, accordion, tabbar. For details see Integration with container components. Here we'll define form items and their positions. also an item which will unite all our elements in a block. It's fieldset. we will use newcolumn item for spliting elements into columns. For all the items (except fieldset and newcolumn) we'll specify the name attribute. We will use it later, for getting(setting) item's value. All the preparations are finished. Now you need to create a form instance. form_container - the id of the container specified before (instead of id, you can directly specify a container object there). We've created all the needed elements but to work as calculator, our form must implement a number of actions: addition, subtraction, multiplication, division. We'll add this functionality by means of onButtonClick event. The method attachEvent will help to attach event handler. For more details about events see Events API. getItemValue(name) - returns the value of the specified item (name). As the method returns value as string, we'll use parseInt function to convert a string value into a 32-bit signed integer.